Knowing how to build a list can make a massive difference to your online success. An opt-in form can make the difference between success and failure in internet and blog marketing, and a squeeze page is an important aspect of that. It has been said many times, but once a visitor has checked out your site they are more likely than not to leave and never visit again. Sometimes they might see something that attracts them and promises to come back, but unless they bookmark your web page or blog they will never return. Fortunately, you have a tool available to help them remember, and to return even if they never intended to! The topic of this post is to explain how you can catch the contact details of all your visitors so that you can keep in touch with that vast majority that would otherwise never see your site again. Roughly 2%-3% of people convert on their first visit – if your offer is good and you are very lucky. It is often way below that – less than 1 in every 100 and your bounce rate will be high. If your site has a high bounce rate, then it is important that you capture these visitors before they leave. Many people misunderstand the term ‘bounce rate’ believing it to be time related. In fact, it is a measure of the percentage of visitors that look at your landing page and then leave without clicking to any other page. The landing page can be your homepage or they might have clicked on a link to an internal page. Whichever it is, they do not visit any other pages on your website – so blogs usually have higher bounce rates than traditional websites (figure the logical reason why). 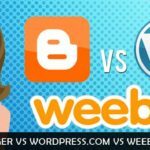 They can remain on that one page for a long time, but if they then fail to click on any links to other pages on your blog or website, then that is one bounce. It is often said by professional marketers that the average person needs about 6-8 views of an offer before purchasing it – and that’s if they are interested in the first place! That’s why TV adverts are so repetitive. So the question is, how do you make it possible for them to get these views, and how to you persuade those other 97%-98% of people to come back to your website or blog? You can offer them great content, sure, but if it was that compelling then why did they leave your site in the first place? Maybe you should make your landing page more interesting and compelling. Some of the most successful internet entrepreneurs owe their success to discussing a problem on their homepage and then providing a link that offers the solution. They then discuss other issues and provide a link to their product that provides the solutions. They also promote these solutions multiple times to their huge mailing lists. It is said that familiarity breeds contempt – however, familiarity also breeds interest. How many of you that are married decided to pop or accept the important question as soon as you met? Very few, if any, I guess. The product looked attractive enough for you to become interested, but you needed a bit more persuasion and familiarity. It’s amazing what familiarity with somebody can do, and the same is true of your blog and your products. Let them see what you’ve got often enough and they will become interested in it – it’s a proven fact. So how do you achieve that? How do you keep people visiting long enough to keep coming, or even to buy your product or service? There’s one sure way – make them an offer they can’t refuse! If you can persuade visitors to complete an opt-in form that provides you with their email address then you have a way to keep in contact. That enables you to email them on a regular basis and give them enough sight of what you are offering to eventually decide to buy it. The product or service you are offering is irrelevant. Maybe you don’t have anything to sell, but just want more people to visit your site. 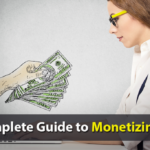 You may have Adsense or some other form of advertising that pays you when they click. If you want them back to hopefully make that click then they must have a reason to give you something that is very important to them – their contact details. They have to trust you! So any promises you make must be kept! Get into the habit of keeping your promises, and providing what you say you will provide, and then your visitors will come to trust you. That’s when they will take your advice – and that’s when you can sell to them. How do you reach that position? An opt-in form is one that asks people for their contact details. Usually, this would be their first name and email address. That is all you need. You might also ask for their geographical location, but it’s not really necessary since this is the internet – no boundaries! This would only be necessary if you offered a local service, such as a restaurant or hairdressing salon. Then, however, you could use local search to limit your response to your own area. To start this process you have to register with an autoresponder service. AWeber and GetResponse are the two most popular autoresponder services available, but there are others. Check our post: Autoresponders: How to Use Them and Autoresponder Reviews for information on choosing autoresponders. These applications provide editable templates that enable you to design your form, including the fields needed. As stated earlier the email address is sufficient, although at least their first name is useful for friendly contact. Visitors may be reluctant if you ask them for more than that. Most autoresponders give you the option of making each field essential or optional – make the email address essential and the name optional. 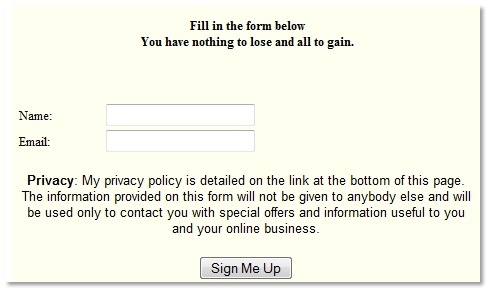 One of the problems you will have is persuading your visitors to register – to fill in the form. Contact information is important to most people, and they do not provide that lightly. You must offer some form of incentive. You have likely seen such forms yourself – in fact, you may even have completed one. A report in PDF format that relates to your niche or the theme of the site. PDF is best because it displays professionalism to many people that a simple Word or text file would not. An eBook, again in PDF format. You can find many of these online, available with Private Label Rights (PLR) that enables you to change the content and use your name as author. You could also write your own – it doesn’t take much time to write a 5,000-word ebook. Probably just a few hours if you know your niche well enough. A video series, showing people how to carry out simple home or car maintenance tasks. Think of your own that can be videoed using a simple webcam or digital camera. Courses are useful because you then have permission to email them with each part of the course. Irrespective of the offer you make, you can then email your list on a regular basis providing useful information. Every now and again you can make a sales pitch – you can even offer another opt-in form for them to join your ‘elite’ group that receives even more ‘ground-breaking’ information. 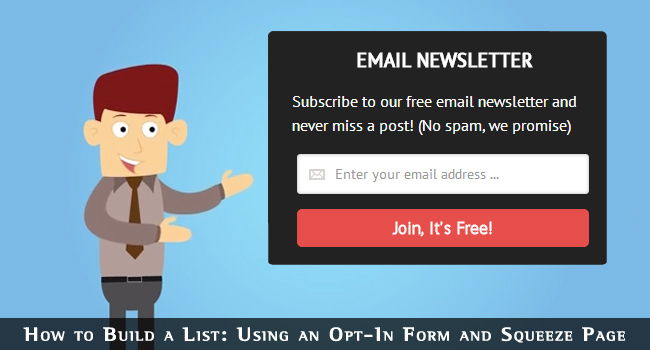 There are many ways to use an opt-in form to build your list and even more ways to use that list to your advantage. It is a trite saying today, but it also true in most cases that ‘The money is in the list.’ If you have a list of interested people, then you should be able to sell those more easily than to strangers visiting your site for the first time – remember these 6-8 exposures! Some have many thousands in their list, and others over a million email addresses. Even a 1% conversion rate results in 10 sales for every 1,000 in your list. Even a tenth of that gives you one sale every emailing. If your autoresponder gives you the option of double opt-in, then take it. Many now include that option as the only one, and it is an important aspect of preventing spambots from filling in your form and of being accused of spamming people who have forgotten completing the form. Once they have provided their email address, respondents will immediately be sent a confirmation email. They must click on a link in that email to confirm their subscription. Spambots can fill in forms, but they cannot answer emails and click on confirmation links. This not only prevents such forms of spam, but also stops people accusing you of spamming them because they basically must opt in twice. The autoresponder also records their IP addresses, so you can prove the opt-in if the accusations become serious. Double opt-in also makes sure as far as possible that your list is reasonably committed. Some people may complete the form, but lose interest after some thought and therefore fail to confirm – others will just forget. These are the people you don’t want. A squeeze page is a page that is designed with one purpose only – to persuade visitors to join your list. Without any doubt whatsoever, a squeeze page is more successful in persuading visitors to complete your opt-in form than simply displaying the form on your blog posts or home website page. The reason for that is that the page is devoted to persuasion, and to nothing else. Take another look at the various types of free offer you can make to persuade people to compete your opt-in form. Every one of these offers can be promoted on a separate page, with compelling reasons why the visitor should accept it free of charge. By the time you have finished explaining why they must have it, they will almost be ready to pay for it – then when you tell them it is free they will jump at it. Your squeeze page is designed to make that compelling case. When designing a squeeze page, it is not the opt-in form that is the most important thing on the page – it is a necessary thing that your prospects must complete so you can help them. The most important component is your offer. Here is some advice on how to design the perfect squeeze page. The #1 rule for a squeeze page is not to ask for an email address so ‘I can contact you.’ It should be because you need it to deliver your offer. The first name can be optional on your form. As stated earlier, most good autoresponders enable you to choose between optional and essential details. The only ‘essential’ is the email address – that’s all you need to contact them. This is where your offer becomes important. Of the suggestions above, only the course makes the email address essential, because the others can be downloaded. OK, you could also make it so you had to email the others, but the course is the ONLY one that cannot be downloaded if it is to be delivered by autoresponder over a period of time. People these days are used to viewing YouTube videos from a link, or downloading PDF and Word files without having to provide an email address. They realize, however, that a course must be emailed, so have no issues offering their email address for that. So, your PDF book and/or niche report could easily be offered as part of a course. Always leave some unanswered questions – even in your course. Let’s say you provide a 7-part course in how to make money using Google Adwords. Explain in 7 emails everything from how to set up the account to make the ads live. Then, in the final email of the series, explain that they must be very careful because many people lose a great deal of money by not monitoring their advertising income and expenditure correctly. You can then offer them another free 7-part course in how to avoid that. All the time you are exposing them to your product relating to online advertising – the theme of the product is immaterial as long as it relates to the topic of the course. The reader is exposed from 7 – 14 times to your product, more than enough to persuade them to buy if they are genuinely interested. This involves no expense to you other than the time needed to set up the original opt-in form and design the squeeze pages. When designing buttons, the graphical form of the button is immaterial. We see lots of beautifully designed buttons with big red arrows and other gimmicks. While they may catch the eye, they don’t persuade people to click. It’s the wording that can persuade them. Which would you be more likely to click? All of these will likely give you a higher click rate than what you normally see on buttons. It’s as if they are not bothered whether you click or not. Be positive and you are likely to get a positive reaction back. You can use a squeeze page for every individual offer you make – several squeeze pages can service one list or you can run each squeeze page for a different list. Two or more lists can easily be administered as one – as long as you are sure you don’t have duplicate members. Most good autoresponders can help you to avoid this. Some people love them and others hate them, but what is a splash page? It is a page that loads before the home page when a visitor reaches your website and can be used in many different ways. Some splash pages act as a portal to the site, offering a number of links to different areas of the website. It is sometimes used by large global corporations to enable visitors to select languages or geographical areas. In your case, the splash page would be your squeeze page, or contain a link to your squeeze page complete with details of your offer along with the opt-in form. There would also a big prominent button saying something along the lines of ‘No Thanks – Take Me To The Main Website’. So the splash page is the first page a visitor clicking to get to your website will see. They then have the option of accepting your free offer to opt into your list, or of refusing and clicking to go straight to your main site. Splash pages can be very effective, but they can also put some people off. However, they are far better than the pop-ups that many people use. They are not so obtrusively ‘in-your-face’ and they cannot be blocked with a pop-up blocker. Some prefer splash pages to regular squeeze pages while others take the opposite view. Like all such options connected with promoting web pages and products, you shouldn’t just take a guess at which is better for you. You should carry out comparative tests, so why not try a month with a splash page and a month with a regular landing page with a link to your squeeze page. You can then measure factors such as conversions through the opt-in form, clicks to the main site and bounce rate. Make your final decision based upon real metrics rather than just gut feeling. 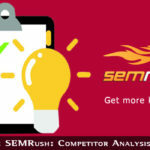 If you know to build a list then you will be able to retain many visitors interested in your site that might have left without taking any action. Some might bookmark you, but the vast majority does not. How many interesting websites and blogs have you visited – and then completely forgot about! An autoresponder offers you the tool, but only you can use that tool to its best effect. Persuasion is a powerful thing, and if you can persuade visitors to give you their email address then you can keep in contact with people who would otherwise be invisible to you. If you follow the above advice, then you will be more likely than not to be successful with your list-building activities. However, the extent of your success or failure is in your hands – and in your ability to be thoughtful and constructive in what you offer your visitors before and after they complete your opt-in form. Yes, one of the most powerful tools in internet marketing is an email list, and the time you spend learning how to build a list is time well spent. Your mailing list can not only earn you more money, but each individual member can refer you to their friends. If they have their own lists then the potential, if you agree to cross-refer, is enormous.